Take a stroll through Mizusashi: Japanese Waters from the Carol and Jeffrey Horvitz Collection and you just might find a ceramic work that would look great in your home. Thanks to the Museum Shop, owning a beautiful mizusashi doesn’t require a bank-breaking shopping trip to Japan—now available are Shiragaki-style pieces created by Rakusai Takahashi V.
Rakusai Takahashi V comes from a long line of renowned potters, following a tradition that spans generations. The Takahashi family produces tea utensils made in the tradition of the stoneware originating from Shiragaki, Japan—the home of one of the Six Ancient Kilns of Japan. Mizusashi: Japanese Waters from the Carol and Jeffrey Horvitz Collection includes two original Shiragaki stoneware water jars, one of which is the oldest work in the exhibition. The Takahashi family has been recognized for their work in preserving ceramic traditions. 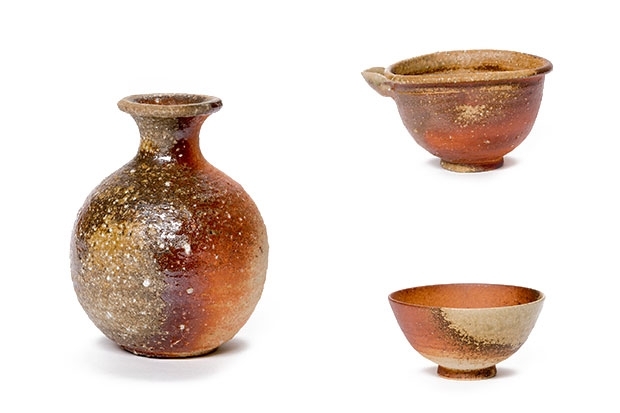 But instead of simply reproducing Shigaraki ware, the family adds their own twist to their work. Their blending of old tradition and personal style has earned them recognition as masters of the Shiragaki craft. “The allure of these pieces lies in where they’re from,” says museum retail manager Cori Mackie. “They’re rustic, representing the colors of the earth.” Mackie explains that the appeal of the Shigaraki style is their adherence to the Japanese concept of wabi-sabi—where beauty is found in imperfections. While mizusashi jars are primarily used during chanoyu tea gatherings to hold cold water before replenishing the kettle, the Museum Shop offers Japanese ceramics for a variety of uses—from Shiragaki-style rice bowls to sake servers. Mizusashi: Japanese Waters from the Carol and Jeffrey Horvitz Collection is on view until June 11.